An article about my installation INcongruence at Moorpark College Art Gallery written by Moorpark College student, Natalie Hyman. Diane Williams is inviting the community to engage and connect people through crocheting. Crochet is a process of creating fabric by interlocking loops of yarn, thread, or strands of other materials using a crochet hook. Materials will be provided but participants are welcome to bring their own yarn and hook. Participants can take or leave their creations to be included in a collaborative installation and become a part of an immersive art project. Beginners, experts and anywhere in between are welcome to join. The idea was inspired by Jean Baudrillard’s, Simulacra and Simulation: “We live in a world where there is more and more information, and less and less meaning.” Social media interactions have become our default social exchanges. Studies have shown that when people are given the platform to connect with one another in communities, they can be a powerful force for change. This is a collaborative social practice project, emphasizing the importance of real connections through art making, social interactions and active participation. Creating positive interpersonal interactions is the first step into building relationships necessary to thrive. I have a solo show coming up, March 1st through April 1st at Moorpark College. There is a reception after my lecture on March 12th, at 11am. Excited to be one of this year's artist in residence at Los Feliz Charter School for the Arts. Looking forward to creating meaningful collaborations with the students. “Hybrid Altar” is a collaborative, interactive installation by artists, Cheng and Williams. It explores identity that traces back from their cultural lineage and identity as immigrants from Taiwan and Philippines. Colonization heavily influenced their customs and traditions. Taiwan was under Japanese rule and the Philippines was colonized by Spain, United States, and briefly by Japan. Under foreign rule, the countries developed unique cultures and rituals that are practiced today but as time passes, people forget the “what” and the “why” of these practices and their origins. A popular tradition in the U.S. is the Wishing Fountain (toss-a-coin-make-a-wish), a European folklore where any spoken wish would be granted. It is a ritual that everyone performs yet very few know of its history. It originated from early European tribes who believed that the water from potable holes was a gift from the gods. The structure is constructed with an environment made of yarn, fabric and plastic woven into wires that are supported by two, 6’ and 4’ metal poles in cement blocks, and a fountain for the offering ritual, surrounded by Chinese gods on Greek columns made of plaster and wood. The yarn and fabric are recycled from friends and family or salvaged from stores that are traditionally owned, operated and supported by immigrants. They provide connections with the histories and memories of Diane’s community as well as the Catholic religion she was brought up in. Under the Chinese gods and fountain is a woven mat, made from the same materials, with the word, “TULOY” meaning welcome in Tagalog, the main language in the Philippines, referencing the Filipino hospitality during a religious fiesta. Ching explored the popular Chinese gods in Chinatown located in Los Angeles, then modified and mass-produced these statues with Greek mythology influences. The immersive display of the gods and the offerings are based on the ceremonial tradition in Taiwanese temples. 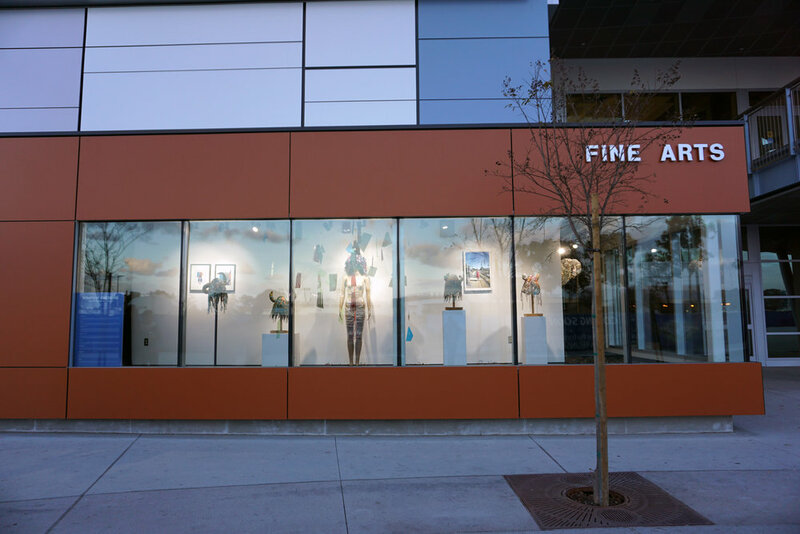 Williams’ installation, “Beautiful Creatures”, mimics the stereotypical presentation of commercial storefront displays, but with a surreal twist. The featured objects on display are pulled from her “Monsters & Aliens” series, which involved the creation of abstract masks, monstrous (self) portraits, made out of shredded paintings and other discarded materials. The masks are placed on a mannequin and stands, combined with shredded acrylic paintings scattered on the floor and cut-up gel rolls hanging from the ceiling. These materials are semi-translucent, diffusing light in a pleasant aesthetic amalgamation, and obscuring the masked female object, subverting the way we are conditioned to see the unfamiliar as only-ever the frightening ‘Other’ - the outsider, the monster, the alien – replaced instead by fascinating, beautiful creatures. Los Angeles Artist Collectives you should Check out! My latest contribution on Art and Cake, an online contemporary art magazine based in Los Angeles, CA. Los Angeles Artist Collectives You Should Check Out By Diane Williams Breaking through the art world has never been more challenging. Folding or merging art galleries and limited government funded art programs are making the competition extremely high along with the saturation of artists producing and showing artwork. My America is William's recent body of work about finding common ground with the community at large. Diane Williams is a multidisciplinary artist whose work stems from the political and social landscape that surrounds her. She uses art as a call to arms, creating works that explore issues about immigrants and gender to encourage cultural and social understanding. In this participatory piece, the artist asked viewers to write the first name of an immigrant (first, second, third generation….) they know and their relationship to that person on a piece of paper and then post it on a wall with an outlined map of the United States. The word immigrant has had a negative connotation in our society. This project examines how people view immigrants and questions their own immigrant identity. Williams and MOAH staff engaging the public with the 2nd installment of her participatory piece, “My America”. I have been getting up early every morning to work in the studio to beat the heat. So far I have managed to do some sketches on possible ideas, art projects and started on a new piece that is in a very awkward stage. Lately, my enthusiasm to want to create and look forward to being in the studio has been dwindling. Being in my tiny backyard studio has been quite a release and satisfying in the past but has been grueling and with much resistance on my part these days. Perhaps it's the summer heat + the climate change factor, the constant barrage of negative political rhetoric on social media and other news outlets, the current upheaval and discontent in my own community, the art proposal rejections one after another or maybe it’s the subject of my work that is weighing down on me. Nevertheless, I know this sentiment will pass and I will continue to persevere. I fervently believe in my own work as it offers something important and rewarding to me. Very early work in progress. Needs a lot of progress at this point! Closing Reception of "My America"
During her residency at Shoebox Projects, Williams created a site-specific installation that further explores ideas of marginalization. In addition, she embarked on a new series of works that track the surges in hate crimes since the inauguration of President Trump. Williams seeks to find a common ground between the works she makes and the community at large. For example in the participatory piece, This in my America, she asks viewers to write the first name of an immigrant they know and their relationship to that person on a piece of paper and then post it on a wall. Collectively illustrating the idea of an extended community. Thanks to everyone who have participated in the "My America" wall and the visits are of course, always appreciated and much welcomed. The residency closes July 9th with a closing reception on July 8th from 3-6pm! Here is the work in progress in pictures. Stay tuned for more. “We” is an exhibition that re-affirms the root aspirations of the American experiment. As our public political discourse has become increasingly toxic and polarized, we return to the core unifying claims of the United States Constitution — that “we the people” have a collective vested interest in the pursuit of certain ideals expressed concisely in the Preamble: “establish Justice, insure domestic Tranquility, provide for the common defense, promote the general Welfare, and secure the Blessings of Liberty”. These pursuits remain just as vital today as they were in 1787. This group exhibition features invited artists to reconsider the immediacy of these core themes of Justice, Peace, Defense, Welfare, and Liberty; exploring the myriad ways these constitutional aspirations remain active challenges to our pursuit of unity as “we the people” in America today. The suite of images is taken through each participating artist’s mobile device dating from the beginning through midway this year. Each photograph captures instantaneous, raw reflections of everyday life while evoking emotions, and insights into the human condition during the first half of 2017. "We: Visual Reflections of the American Experiment" is organized by Alyssa Cordova, Assistant Curator, Orange County Museum of Art, Jennifer Frias, Associate Curator, Sweeney Art Gallery, UC Riverside, and Jeff Rau, Director and Curator, Earl and Virginia Green Art Gallery, Biola University. Photo courtesy of Diane Williams. First week at Shoebox Projects, an experimental space. Still a few more things to complete "My America". I'm enjoying the experimental aspect of the residency, working and re working to see what works and what doesn't work within the space and how each pieces responds to each other and make the whole project connect. I have not done a drawing piece in a long time and how I miss it! Check out the progress shots from start to finish. The Whitney biennale’s controversy with artist, Dana Schutz’ painting depicting a mutilated face of Emmett Till, a 14-year old African American boy who was tortured and lynched by two white men in 1955 has been a contentious subject on my social media feed. After reading both sides of the story, still some ambivalence as to which side to take or if there is even a side to affirm as things are never black and white (no pun intended). In all seriousness, the issues surrounding this incident is not surprising as civil unrest and vitriol is deeply felt by most Americans today. The 2016 election triggered and aggravated a multitude of problems we are facing and the presidential outcome undoubtedly divided many Americans. Race relations problem is among the many complex hurdles we are facing still to this day. This subject prompted me to art critic and writer, Hal Foster’s “Artist as Ethnographer” written in 1995 which offers some insights to contemporary art making. In this essay, Foster questions the effectiveness of the role the artist plays as an ethnographer. Ethnography is the systematic study of people and cultures. It is designed to explore cultural phenomena where the researcher observes society from the point of view of the subject of the study. Foster sites assumptions that lead to the dangers of ideological patronage. The assumption that if the artist is not socially or culturally other, then he or she has limited access to this transformative alterity (otherness) however, if the artist is perceived as other, then he or she has automatic access to it. Many contemporary artists are well aware of the accusations as contributors of pseudo-ethnography but the subject of culture is immensely complex and given today’s political climate, the “exotic other” as coined by Edward Said in his book “Orientalism” is more relevant now than ever. As she paints the piece, Dana Schutz admits that her painting of Emmett Till will be problematic. It is certainly igniting dialogue that both artists and viewers are divided on. One can argue that this painting is insensitive—- a misrepresentation by the artist or maybe the work is simply just unresolved. Before arriving at a conclusion, maybe it’s fair to look at some key factors. We know that the artist is a white woman who claims to use ‘alterity’ as a primary point of subversion of dominant culture. Schutz is well known for her work that depicts subjects in her paintings as humorous points of departure. Would the painting receive protest if the artist had a different background? Does our present political culture that promotes systematic racism stemming from the 45th President down to our local law enforcement contribute to this heightened critique of this piece? There are various questions to point out in this important debate. Many factors should be considered before making statements, as they should be thought of with respect and contemplation if our intention is to recognize one another and coexist. Having a dialogue is definitely critical but it is more effective when both sides are heard. We celebrated the opening of Personal Narrative on Tuesday, Feb. 28th and got a warm reception from artists and the Santa Monica community. Thank you to Sheli Silverio and the staff at Annenberg who helped coordinate the show. 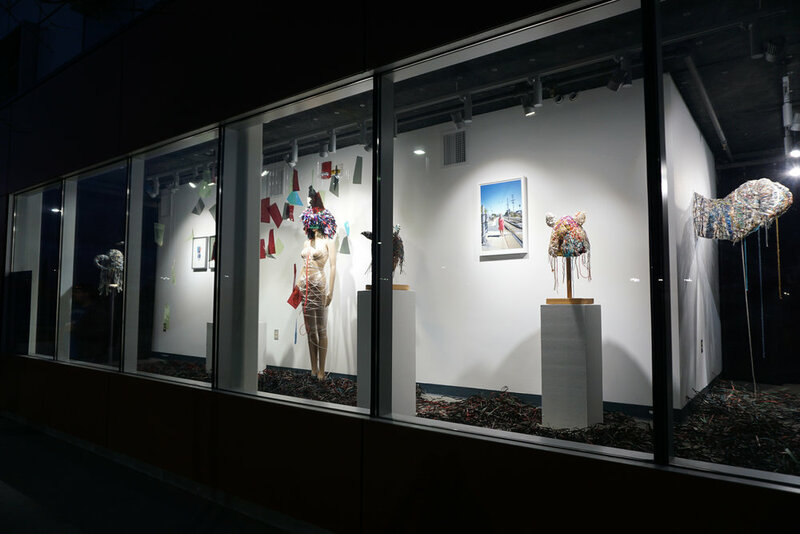 I wrote the proposal to showcase the identity and the individual context of the artists included in the show with works ranging from stories about their Jewish diaspora, gender disparities, body image issues, environmental concerns and immigrant background. Keeping in mind that our Personal Narrative shapes and molds who we are as artists and makers in the 21st century. The show runs through June 4th!